"First Universalist Church & Y.W.C.A. 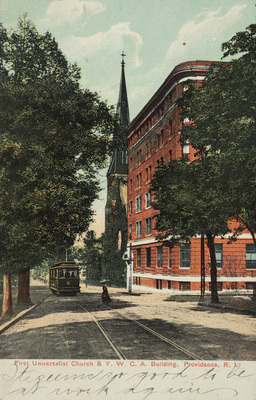 Building, Providence, R.I." by Rhode Island News Company, Providence, R.I.
First Universalist Church & Y.W.C.A. Building, Providence, R.I.
Used; Postmark: September 04, 1907. Rhode Island News Company, Providence, R.I., "First Universalist Church & Y.W.C.A. Building, Providence, R.I." (1907). Rhode Island Postcards. 459.